People often ask me “is Japan expensive”? Yes and no. For example, down the street there is an amazing sushi vendor who has wonderful fresh sushi for very reasonable prices; 6 maki rolls for $3 or $4 and a nice sushi plate for $11. Right beside it is a noodle restaurant where prices range from $8-$12 and the food is fantastic. 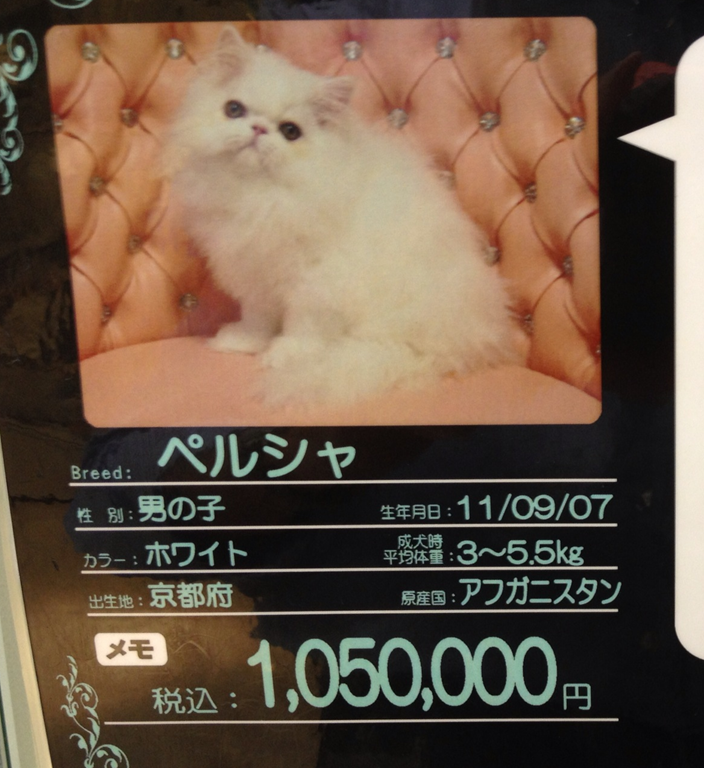 However, some things are expensive such as apartments as real estate is at such a premium and apparently cats – very expensive at some shops. For my Canadian friends … that translates to $13,075. This entry was posted in Our Asia Adventure and tagged cats, expensive, Japan, Tokyo by michaelweening. Bookmark the permalink. yep.. you’ll never find a mutt dog or just a plain old cat.. unless it’s out at some shrine or something! always purebreds…! strange, yea?